Transparency Market Research (TMR) has published a new report titled, “Dementia Associated with Alzheimer’s Disease Market - Global Industry Analysis, Size, Share, Growth, Trends, and Forecast, 2018–2026”. According to the report, the allergy-relieving eye drops market was valued at US$ 1250.0 Mn in 2017. The market is anticipated to reach US$ 1,930.0 Mn by 2026, expanding at a CAGR of 5.0% from 2018 to 2026. Rise in number of geriatric patients, increase in awareness regarding minor eye disorders, and high unmet medical needs are expected to augment the global market from 2018 to 2026. The allergy-relieving eye drops market is projected to expand owing to an increase in the prevalence of eye-related disorders among the population, demand for better treatments, and development of healthcare infrastructure in various economies. According to data published by United Nations Department of Economics and Social Affairs, the global geriatric population is expected to double by the end of 2050 and is projected to reach nearly 2.1 billion. This increasing geriatric population is prone to significant risk of eye-related disorders, including blindness. Public awareness regarding common eye conditions is increasing in developing countries, leading to early diagnosis and treatment of eye diseases. Furthermore, a large number of organizations are dedicated to fight blindness, restore vision, and create awareness regarding eye health. National Eye Institute, National Association for Visually Handicapped, National Federation of the Blind, and Prevent Blindness are a few eye health organizations concerned with the prevention of eye diseases. According to World Health Organization (WHO), there are 285 million visually impaired people globally, approximately 90% of them living in low to middle income countries. Furthermore, approximately 95 million people suffer from cataract and 20 million suffer from various eye conditions, including glaucoma, muscular degeneration, infections, and childhood-related conditions. Significant rise in incidence of eye-related diseases, especially in developed countries, is anticipated to drive the allergy-relieving eye drops market between 2018 and 2026. Patients undergoing open angle glaucoma and AMD in the U.S., were 2.7 Mn and 2.1 Mn, respectively. This number is projected to increase to 3.3 Mn and 2.5 Mn, respectively, by 2020. Increasing patient pool in developing countries as well as developed countries is estimated to propel healthcare spending for eye treatments in these countries and drive the allergy-relieving eye drops market. The currently available treatment options are insufficient, as almost 30% to 40% of patients suffer from persistent allergic inflammation due to incomplete response to antihistamines. Therefore, a large proportion of patients with ocular allergy have high unmet needs, providing an opportunity for the development of novel treatment for eye-related allergies. According to an article published in NCBI, approximately 20% of the total population suffers from some form of allergic conjunctivitis and significant proportion of patients experience chronic allergy due to low response to existing therapies. In terms of drug class, antihistamines was a highly attractive segment of the global allergy-relieving eye drops market, followed by non-steroidal anti-inflammatory drugs and vasoconstrictors segments. This is attributable to the preference for antihistamines as the first line of treatment for allergic conjunctivitis. According to a study published by NCBI, dual-acting antihistamines combined with mast cell stabilizers are considered the first-line therapeutics for allergic conjunctivitis, as they provide acute relief against signs and symptoms and block persistent inflammation to promote regression of ocular allergy. Moreover, they are well-tolerated for chronic usage in case of persistent ocular allergies. North America dominates the overall allergy-relieving eye drops market due to a large patient pool, high cost of specialty branded drugs, and increasing patient pool. The region is estimated to maintain its dominance of the global market during the forecast period. According to an article published by The Journal of Allergy and Clinical Immunology, up to 40% of the U.S. population experiences ocular allergy at least once in their lifetime. Moreover, rising healthcare expenditure and increasing investments are key factors that are anticipated to boost the allergy-relieving eye drops market in the next few years. 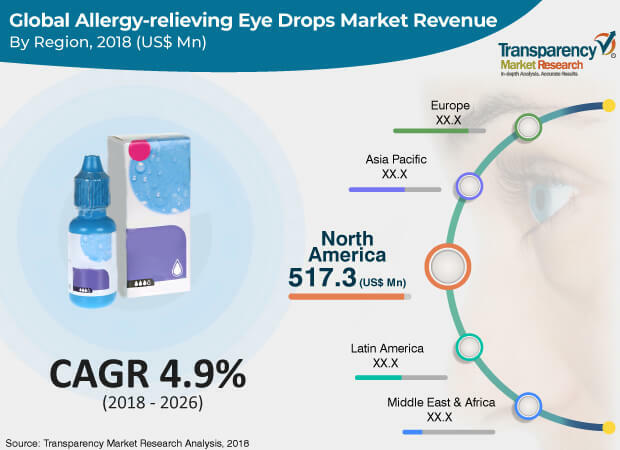 The allergy-relieving eye drops market in Asia Pacific is projected to expand at a notable CAGR due to increasing awareness regarding allergy-relieving eye drops in developing countries and government initiatives introduced in the region. Investments by key players is driving the global allergy-relieving eye drops market. Key players dominating the allergy-relieving eye drops market include Allergan Plc., Johnson & Johnson Services, Inc., Pfizer, Inc., F. Hoffmann-La Roche Ltd., Novartis AG, Bausch Health Companies Inc., Regeneron Pharmaceuticals, Inc., and Santen Pharmaceutical Co., Ltd.